… wait, what? TmoNews just got some leaked slides of plans to push WiFi Calling on select T-Mobile Android phones? You don’t say! Yes folks, it’s another week and another coup by the ninjas at TmoNews. This time we’ve got some pretty compelling evidence that a certain Android phone, a certain mindboggling-keyboard-swivel-y phone, will be enjoying the ability to make calls over WiFi for free. The slides indicate that you will simply have to toggle on the setting in a new WiFi Calling app, and then dial away as normal. This is a much neater solution than in-app dialling, and circumvents any third-party routing as in Google Voice. There is little indication as to which phones will receive this bountiful ability, but the screenshot in the slide below looks very much like a G2. 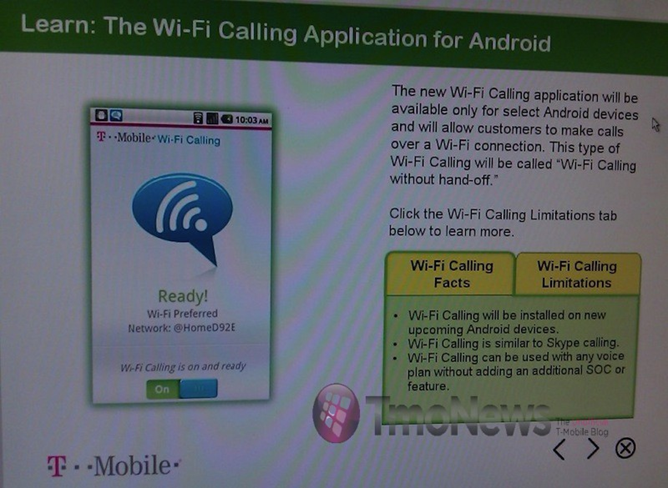 As well as this, TmoNews say they have their own, separate screenshot of the WiFi Calling app installed on a G2, so it's a pretty safe bet that the QWERTY swiveller will be getting it. When? We don't know, but it seems unlikely that T-Mobile would have kept this quiet about the feature if it were to be available when the G2 launches on Ocotober 6th. 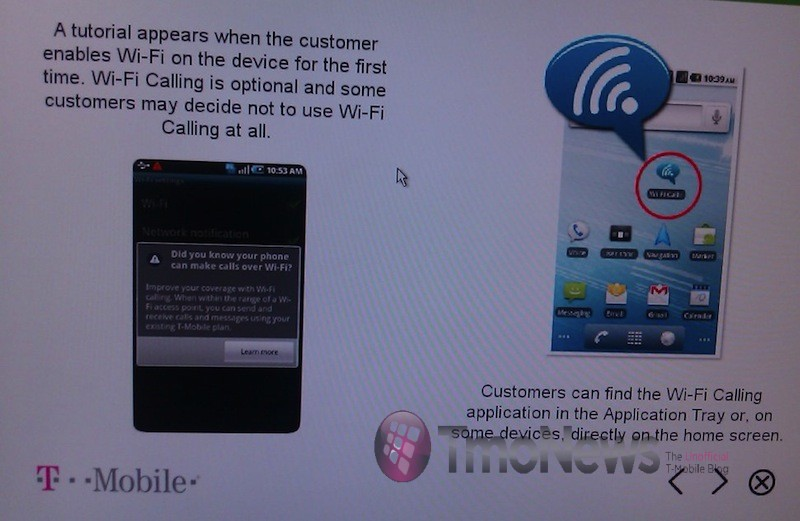 Another possibility is the LG Optimus, which also had some WiFi Calling screenshots up earlier this week. Oh and obviously the white iPhone will have UMA on T-Mobile/Verizon combined when it comes out. As noted by TmoNews, there are a few cracks in T-Mobile's otherwise earth-shattering proposition. The main letdown appears to be the lack of hand-off between the WiFi and GSM networks, meaning your call will drop when you leave your home's wireless network and get picked up by T-Mo's. This is something you'll have to be conscious of when starting calls just before leaving the house, and it seems like it could prove to be quite the inconvenience. The other issue is that we don't know for definite what other phones will be getting UMA, and when. In this situation, there's not much more we can do but sit and wait, 802.11n at the ready.